← How do I download the internet? Ever since I moved to this country, I’ve started doing things without being exactly sure why I do them. One of them is stopping for a chat when I run into someone that I don’t particularly like. I’m puzzled by my own strange behaviour. I’m hardly a social animal and in most cases it would be just as easy to walk on after saying ‘hello’, especially if the other person makes no obvious move to engage me in conversation. I described my strange social conduct to my best friend, who is Scottish and therefore knows more about the mores of this country than I do. Actually, I have. I now eat eggs with HP sauce. I now drink my tea with a dash of milk, no sugar. I now drink beer in pints at the same speed as I’d drink a 33cl back home. I now call dinner ‘my tea’ (as in “I think I’ll head home for my tea shortly.”.) And I have long ago yielded to the baked potato, that staple of staples, that most British dish of them all, that ubiquitous, ghastly, but at the same time delightful lunch option. But I feel the need to prove how European I am, so we’re not going to fill it with tuna-mayo, or with boiled egg, or with grated cheddar, or, God forbid, with baked beans (which toppings, in all honesty, I still find offensive to almost all of my senses, British or not). We’re going to fill it with weird and healthy stuff. 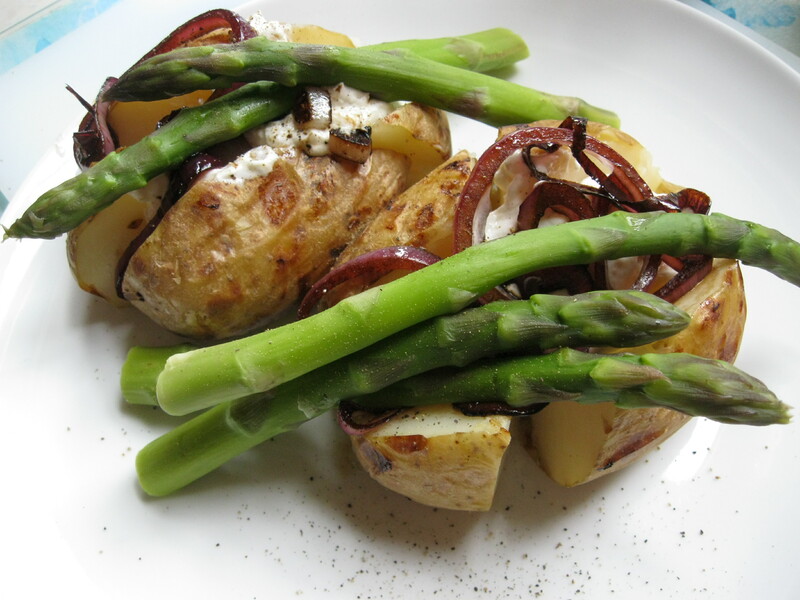 Baked potato with goat’s cheese and green asparagus! Tell me I’m becoming British one more time. I dare you. Also, you’ll need some tin foil for the preparation. Wash the potatoes and dry them well. 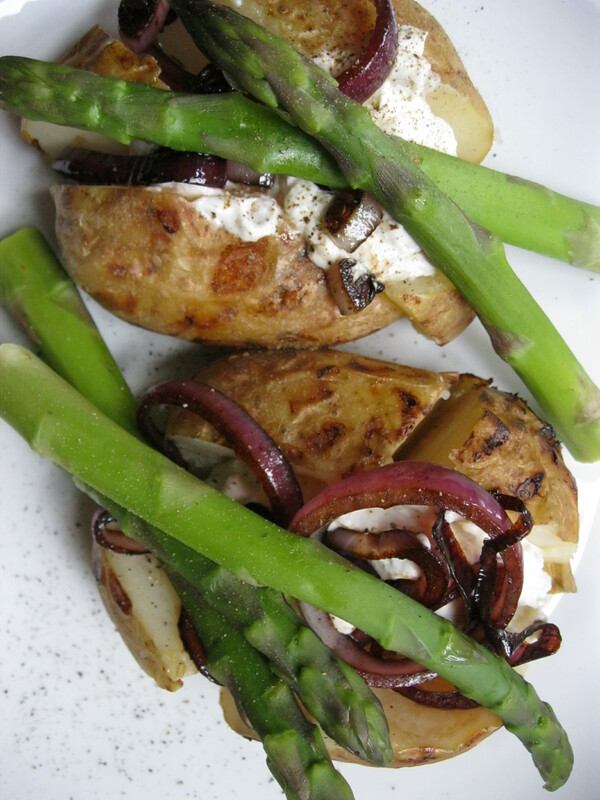 Use a fork to poke holes in them, spread out evenly around the potato. Wrap them individually in tin foil and pop them in a preheated oven (200°C) for at least an hour (but this depends on the size of your potatoes: bigger ones might need an hour and 15). Slice rings out of the onion and fry them gently in some olive oil. Keep the heat low-medium. Once they’ve gone soft, turn up the heat and add a sprinkle of balsamic vinegar. Stir occasionally and take off the heat once the vinegar has evaporated/been soaked up completely. Take the ends off the asparagus and boil the stalks in water with plenty of salt for about 5 minutes. Mix the yoghurt with the goat’s cheese. Taste and add some black pepper and, if you feel you have to, a pinch of salt. Once the potatoes are done, take them out of their tin foil and cut a cross on the top so they can easily be opened and stuffed. Now scoop in some of the cheese mixture, some onion, three stalks of asparagus each and top with some more pepper. 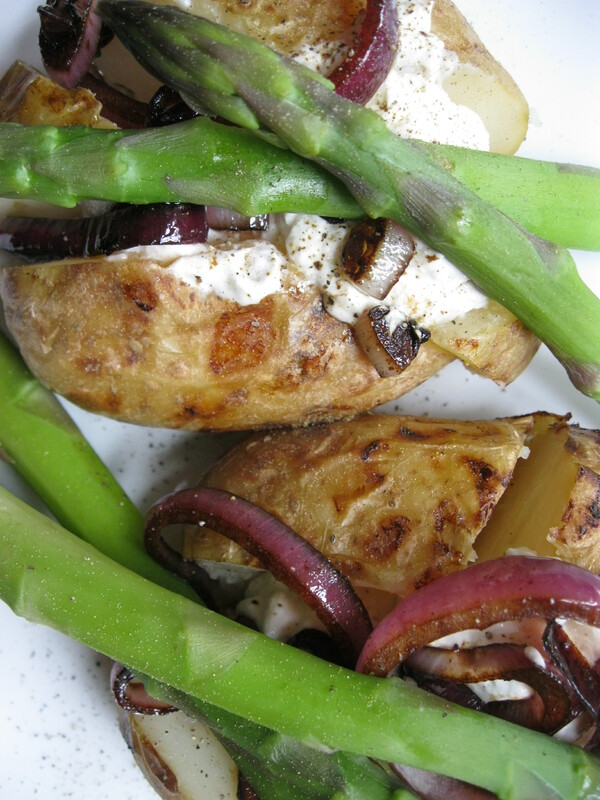 This entry was posted in Food, Vegetarian and tagged baked potato, British, cooking, foodie, politeness. Bookmark the permalink. 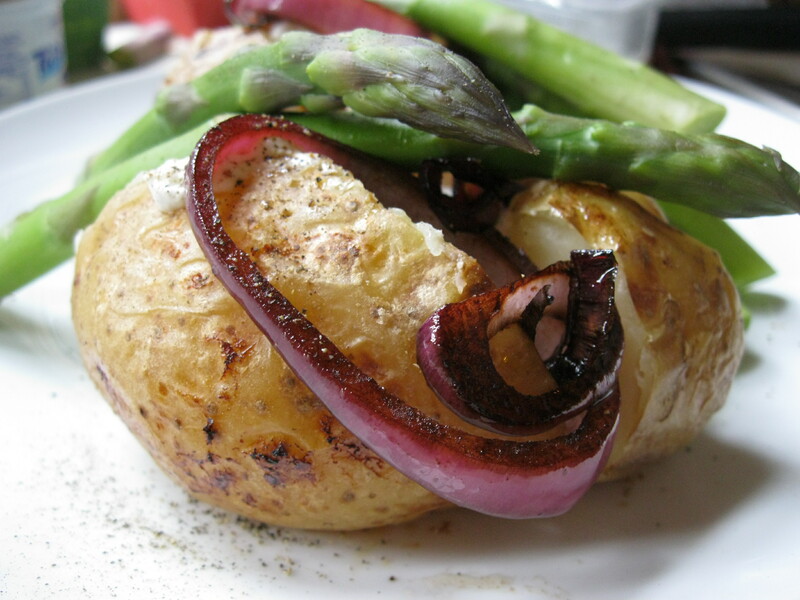 Some people here do call them jacket potato, but baked potato is more common. Probably because it’s quicker, the Scottish seem to prefer the short version of just about anything. Baked tattie is the fastest way of saying it, and… yes… that’s what I’d say generally :) Just discovered your blog Veerle! As a fellow foodie I can’t believe I missed it for so long… And now I’m exceptionally hungry and must go cook something!